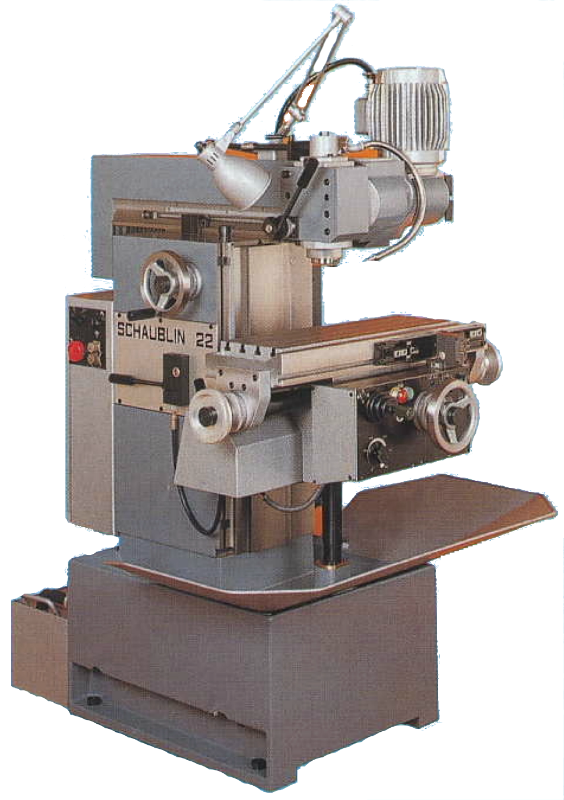 The 22 was the last tool-room milling machine to be developed by Schaublin SA. Sold between 1967 and 1995, in some respects, it can be regarded as Schaublin’s answer to the Bridgeport-type turret mill. However, it proved to be a slow seller with just over 600 machines produced in 28 years. As with the 53, Schaublin abandoned the “continental pattern” and opted for a knee type design for the 22 but retained the movement of the milling head to give the X axis. With a table measuring 650x250mm, travels were somewhat unusually proportioned at 330mm longitudinal (x), 400mm headstock (y), and 475mm vertical (z). Feeds to the longitudinal (x) and vertical (z) axes were infinitely variable and selected via a joy-stick mounted on the face of the knee. A clever electro-mechanical system of stops and miroswitches allowed “programmable” cycles to be set on the machine. Unusually, the 22 employed a milling head that tilted front to back rather than side to side. 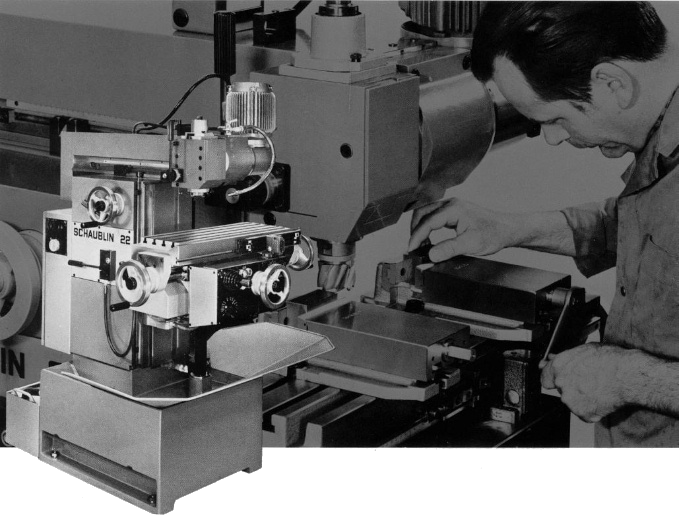 The 30 ISO milling head featured a lever operated sliding quill and was powered by a two speed 1.5kW motor driving a six speed gearbox providing twelve speeds between 63 and 2800 rpm. The video below gives an extremely good overview of the Schaublin 22. Many thanks to Arnljot Seem for sharing this – check out his other videos showing the rebuilding of the machine.